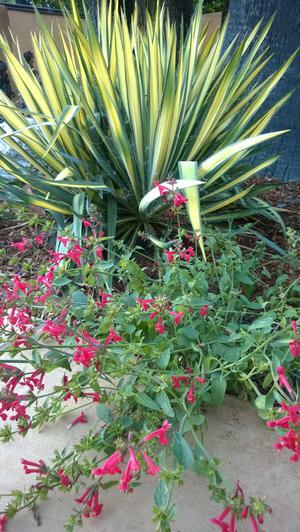 Scarlet betony is native to Texas, Arizona, New Mexico, Baja California, Mexico and Nicaragua. The plants we're growing at Gold Rush come from seed originally collected in Graham County, Arizona. Scarlet betony has a naturally loose and sprawling - but not untidy - growth habit. It grows about 12-15" tall and 18" wide. The leaves are bright green and feel velvety soft because both the upper and lower leaf surfaces are covered in tiny silky hairs. Bright salmony-red tubular flowers bloom constantly from late spring through fall. Plant scarlet betony in a sunny location where it'll get direct sun for at least half a day. Scarlet betony prefers soils that drain freely. It's tolerant of clay soils, but if you have clay, don't plant it in an area where your soil's completely waterlogged for long periods of time in the winter. Young plants will benefit from being watered for the first few months after they're planted while their root systems are establishing. As with most plants, infrequent, deep watering is better than frequent shallow watering because it encourages the roots to grow deeper in search of water. This will make them more drought tolerant. Once established, scarlet betony will survive in most areas of California on rainfall alone. It'll happily accept extra water if necessary though. 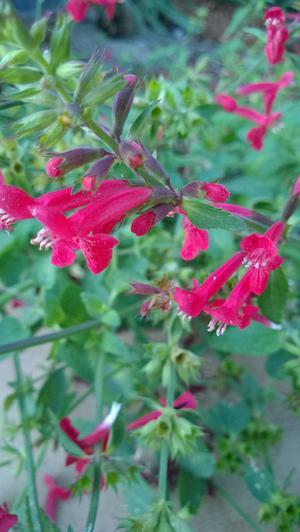 The scarlet tubular flowers are a magnet for hummingbirds and also attract bees. Scarlet betony can be grown fairly easily from seed. No special treatment is needed. The seeds are round, black and about 1mm in diameter. Cut back spent flower heads to encourage the formation of new stems and to prolong the blooming season. Trim back the plant as needed to maintain a mounded shape if desired. Don't do this, though, if you prefer a more natural look. After flowering's finished for the year (usually in mid-October), cut the plant back by about one-half to encourage new shoots to sprout for the next season. Put a thick (at least 3") layer of mulch around plants. This will reduce evaporation of water from the soil and, therefore, reduce the need to water in the summer. The mulch will also protect the roots from frost in the winter and help keep weed seedlings from emerging.